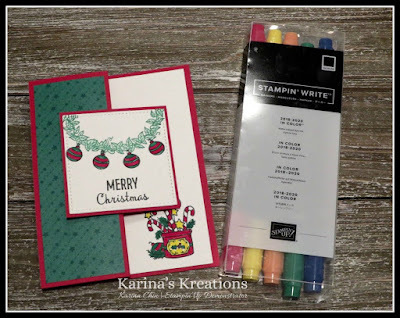 Karina's Kreations: Stampin'Up Many Blessing Christmas Card! Stampin'Up Many Blessing Christmas Card! I wanted to feature a different way of using this fun stamp set with limited supplies. 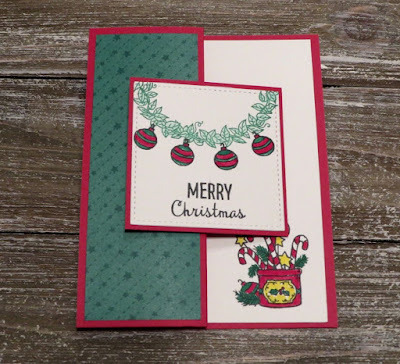 When you're a new stamper, it can be hard to design cute cards with limited supplies. This is card is designed around the 2018-2020 in- colors. You will need a Black Memento and Call me Clover ink pad and the 2018-2020 In-Color markers. I also added some All is Bright Designer Series Paper and cut a square with the Stitched Shapes Framelit dies. 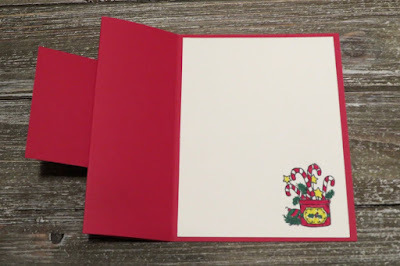 I would cut a 2-5/8" x 2-5/8" Whisper White square with your paper trimmer if you don't own a Big Shot. The wreath was stamped with Call Me Clover ink and colored in with a Blender pen. The ink is water based so the color bleeds when you go over it with the blender pen. Please click on a picture below to order supplies for this card.